The message remains; 2018 will be volatile and at times uncomfortable. It is interesting that when we meet fund managers the message seems consistent; there are risks (which I will expand on), and there is likely to be a global recession (this could be in two years’ time, possibly sooner, or further out). In terms of a potential global recession, economists have mapped historical indicators and using these perfect metrics have concluded that the US ‘should’ fall into a recession in about 2020. This will then feed out across the globe. Many managers I meet seem to be happy to follow this line of thinking, however I think it is fair to challenge this. 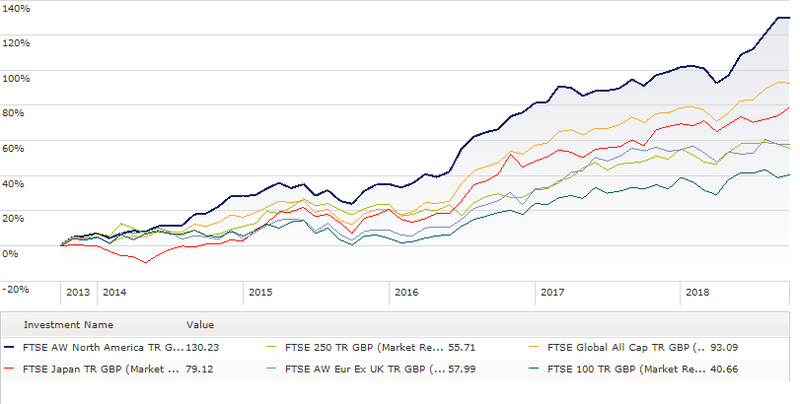 Firstly, although we have seen strong returns since 2009, much of these was driven by a re-rating in the market follow the significant falls in 2008/2009. However, the underlying positive economic data has only started to feed through in the last two or three years. The argument could be that we are more mid-cycle than late-cycle and if this is the case then a recession could be pushed out beyond 2020. The second point is the unknown factor; QE pumped billions of dollars into the system and economies saw interest rates fall, as this is unwound the impact of this is unknown and whether this quickens or lengthens the time to any potential recession. So, in terms of a recession we would tread caution because everything is based on the old way of thinking, and there are different factors to consider of which we can’t really guess the outcome. When we consider risks, this seems an interesting topic of debate. Watching the news or reading press reports the biggest global risk from a UK perspective is Brexit. As a country we seem polarised in the way we think about Brexit and its impact on global trade. We will cover this in more detail in the review but there are many variables over the coming weeks and months. Will we have a hard or soft Brexit, and what does this mean? Will Labour vote down any deal and force an election, if Labour win what will happen to the economy with taxes on the “rich” and nationalisation of the railways and other infrastructure. Or if there is no election will May stay, or will she be forced out, with Boris or Jacob as potential replacement Prime Minister. How will that change things? If we ask someone with focus outside of the UK what they see as risks to the global economy, then they normally list in this order – Chinese debt, Italian debt, Trump, terror attacks and then Brexit. Even when we look at this there are questions; is Chinese debt as bad as the developed economies think or is it that we don’t understand how the economy works? Italian debt is perhaps harder to understand but Europe is not in the same fragile state as it was in 2011 when the Greek crisis was at its height. Trump is tricky because no-one knows what he will say next. We still believe deals will be struck and these will likely help him in the mid-terms. What happens beyond that we have no idea. Terror attacks will always be a concern and the extent of their impact is always an unknown. Ultimately, the biggest concern for global growth is the unknown, and people will always debate what we should be concerned. It is worth adding that since 2012 there have been 11 calls for a market crash, and at some point in the future someone will be right. In summary, 2018 is playing out how we expected, and we know there are concerns. However, investing is not a sprint, it is a marathon Slow and steady, time and time again over the long-term seems to be the most consistent way of delivering returns. This quote is a perfect way to sum up the world of investing – “the two important points of investing are the ‘in price’ and ‘out price’, everything else is noise”. Special note to graph: You should note that past performance is not a reliable indicator of future returns and the value of your investments can fall as well as rise. The total return reflects performance without sales charges or the effects of taxation but is adjusted to reflect all on-going fund expenses and assumes reinvestment of dividends and capital gains. If adjusted for sales charges and the effects of taxation, the performance quoted would be reduced. We remain positive on developed economies, prices in the markets are fair value and consumer confidence in the US and Europe is at its highest level since the global financial crisis. With growing incomes, consumers seem more willing to spend. We touched on the fact that a potential risk to global growth is Trump. A single Tweet moves individual stock prices in the short term, or markets by about 1 to 2% but often this is recovered in the following days. A Tweet is unlikely to cause a global melt down, but what might do this is a protracted and painful trade war. The US is in a goldilocks scenario in which the economy is neither too hot to force a sharp rate tightening cycle, nor too cold to slow down corporate earnings. This is positive and is why we have seen continuous record highs on the S&P 500 this year. But we can’t ignore trade wars (whether Trump is right to pursue this or not); history shows that these tend to be destructive with the eventual result being that there are no winners, with one party being better or worse off at any given point. Presently it is easy to argue that the US seems to have the upper hand because of the strength of their economy, but what happens with the eventual slowdown because at this point the whole trade war could backfire. It is also worth adding that many developing economies no longer see the US as their main trading partner and this has shifted towards China, which in time is likely to move away from being reliant on the US. Any ‘game’ by Trump has to be carefully conducted (and I would argue that Twitter is not the right place for diplomacy). We belong to the camp who think this is about “trade bluff” and that everything will be resolved in the coming months; if this happens the markets will be happy. Ultimately Trump wants to win the mid-term elections and perhaps the next Presidential elections. If he can go to polls with trade deals, then this will help his chances of winning the mid-term elections. If he wants to win the presidential elections in 2020, he cannot afford to see an increase in the cost of imports, US companies struggling to do business in developing economies and pressure on inflation as consumers turn to US products. Logic would therefore dictate that deals have to be done soon. Just touching briefly on interest rates there is expected to be two more increases this year and two in 2019 which would bring rates to around 3%; beyond that we don’t know how much further they will rise. The Eurozone will always be mixed but consumer confidence is high, although there are risks. The Netherlands, Portugal and Germany are all recording strong growth figures. But on the flip side Austria, Spain, France and Italy have all slowed slightly. A weakness in the Euro against the dollar has helped exports, but has pushed up inflation from imports. QE should come to an end this year and we expect rates to rise 2019. But if the trade war escalates then the Eurozone will be hit because they are exporters and a weakness in global trade will hit this region. The bureaucracy of Brussels and the apparent stubbornness within the Eurozone to try and agree any deal with the UK seems unrelenting. The question of the Irish border has been going on for hundreds of years; it is the cause of many years of unrest, and to assume a simple solution is crazy. The Eurozone must know there is no easy solution to the Irish border, but equally they have a set process for those countries who want do business with them have to adhere to. The UK cannot expect to bypass that and impose their own rules. The approach needs to be led rationally and logically and a solution found which leads neatly onto the UK. Personally, I have no political bias, but it has become clearer that very few politicians care about us as individuals. Labour seem to have played a blinder; their plan is simple – vote down any deal and force an election. But what happens if they vote it down, an election doesn’t happen, and we end up with no deal? If they force an election and win, will it be in time for them to get a deal in place? Another scenario would be a leadership contest and either Boris or Jacob taking the helm which would likely lead to a ‘no deal’ situation. We are sitting on a knife edge; the Eurozone must compromise around the Irish border and the UK should understand it cannot change the trading rules the Eurozone has in place. Labour (however clever they may think their plan is) need to understand that the end result of their action could be to force us into a no deal scenario and hard Brexit (which might be what they want). What does it all mean? We don’t know for certain the outcomes but logically a soft Brexit would see Sterling strengthen which should bring down the cost of imports. On the flipside the FTSE might shrink back as exporters don’t see the same benefits from overseas profits due to a weak Sterling. It is potentially not good news for householders as interest rates will likely rise, which will have a negative impact on the housing market. A hard Brexit would likely see Sterling fall further; from an investment view this could benefit investors. Interest rates are unlikely to rise in the short term which will leave house prices in the same situation as they are now but, on the downside, imports increase, and this will impact the consumer through higher inflation. Before we look at some of the challenges it is worth touching on what could happen if Labour came to power. Away from Brexit, they have talked about nationalising the railways and other infrastructure services. There are two potential challenges to this; the cost of nationalising these services and compensating investors is billions of pounds and that money must be found without crippling the economy. Secondly many of the investors in these companies are foreign and in making this move you are potentially saying that the UK is not open to this type of investor. If you time this with Brexit, you create an ugly mess. The reality is that any future government potentially moves more to the centre ground to do what they can, but the ‘bid ideas’ don’t happen. Away from the UK, Europe and the US, Japan is an economy to watch especially with Shinzo Abe’s landslide victory in the ruling LDP party’s presidential election. Since 2012 significant economic reform has been implemented, and companies are becoming much more profitable. Over half of the companies on the TOPIX have significant cash surpluses on their books. This was driven through by a period where they couldn’t turn to banks and the stock market for funding and therefore had to be self-sufficient. Despite changes in the economy the market has not re-rated since 2012 and companies are trading at a 30% discount to the US and Europe. Japan is less impacted by trade wars; firstly, they are a strategic partner to the US and are less of a target than China. Secondly, Japanese companies tend to be global with manufacturing plants in the regions they supply. Japan could actually benefit from the trade wars, for example if Caterpillar is forced out of China, this could benefit Kamatsu. So, US companies could lose out in this battle. There are concerns about demographics and this is not a positive thing but those retiring tend to be older males who were well paid. These retirees are being replaced by a younger workforce and robots, which helps companies improve profitability. Women entering the workplace plugs the labour gap and estimates are that this should hit a peak in about ten years’ time. The peaks and troughs of the past seem to have flattened out in recent years and positivity in Japan means there are still opportunities for shares to re-rate. In summary, on the positive the US and Eurozone are showing increased consumer confidence. The US is powering ahead, and Japan could benefit from a re-rating in company share prices and potentially some of the trade sanctions against US companies. An individual Trump tweet causes short term fluctuations, but the real danger is whether Trump is bluffing or for real when it comes to trade. If it is bluff then we can expect to see some deals in the coming months, if it is for real then we can expect this to hit global trade and that could bring forward a global recession. The UK is challenged but there are too many potential outcomes to know where we end up, what we do know is that over the next few months there will be a lot of noise and Sterling is likely to suffer or benefit most from this. Investing in developing economies is a roller coaster ride and tends to be driven by sentiment rather than fundamentals. Emerging markets have had a rough ride this year. This has been driven by several factors which include Turkey and Argentina, and trade tensions. Investors tend to flee markets when it feels uncomfortable, but it is worth looking long-term at why we should invest in emerging markets, and why it shouldn’t be ignored. Like developed economies these countries have challenges and many need reforms to continue to develop but the pace of change combined with younger demographics means that the long-term investment story remains compelling. In terms of Turkey and Argentina these are just two countries in the developing world. They are not representative of every country, and yet it feels that if there is negative sentiment with two economies then everything is rotten, which is not the case. It is worth adding that Argentina has seen seven years of reform and although the stock market was perhaps overheating, the reform programme remains in place. Trade tensions are of course a worry: we don’t know the eventual outcome and we believe much of this is bluff. However, as we have indicated there are rarely winners in the long-term. The US may have the upper hand now, but we are already seeing many economies trade more with China, or their closest allies, than the US; this means that China is becoming less reliant on the US. If this continues then the shift in power moves to the developing economies. Many Asian countries along with Europe, are trading between themselves, and over time US protectionism can turn to isolationism and Trump must understand the implications of this. For this reason, we believe this is bluff. In terms of Chinese debt, we covered this briefly in the last update and the view really doesn’t change. It has increased significantly but it is not at the same level as some of the developed economies, and the reality is that we are trying to compare this against the developed world. We don’t know yet what it means for China and what, if any, risks it carries. Worries about Chinese debt keep re-surfacing and have done so for many years without alteration. Brazil suffered from a collapsing oil price, and a political, social and economic crisis which saw it plunge into recession. Things are changing slowly with commodity prices improving, inflation is steady, interest rates lower and unemployment has stabilised. Fundamental reform is needed but it shows that countries can and do pull themselves out of crisis. India’s limited exposure to global trade shields it in global downturns, particularly driven by higher tariffs and for now, the domestic economy appears to be gaining strength. We shouldn’t underestimate the reforms going through and the positivity this has created. The Indian banking system is one of the fastest growing banking systems in the world. Considering that India’s formal economy remains a fraction of the country’s GDP and that only half of the population’s savings are in financial assets, there is significant growth potential for banks. Private-sector banks currently have a market share of 30%, while state-owned banks make up the rest. However, these are less competitive and lag in areas like automation, technology, customer service and management quality. Thus, private sector banks are expected to grow faster and gain market share. Recent concerns about high levels of bad loans at state banks could also benefit private lenders. Whether having a one-party state is right or wrong, Putin has installed an element of stability especially when compared to many developed economies that endure the opposite. Obviously disagreeing with the party line could place you in trouble, but for the majority this has been positive for Russia. Sanctions are a concern, but Russia can still trade, and companies are much better run than in the past and the labour market has improved significantly. The economy is running on a slight surplus and it is perhaps an example where the press and politicians paint very different pictures to the reality. In summary, Emerging Markets, Asia and Frontier Markets are diverse regions with many countries and different sectors. This year has seen a big correction in part due to nervousness surrounding Turkey and Argentina, and trade concerns. But the reality is that many of these countries will grow irrespective of current events and they will become the powerhouses of the future. Inflation took an unexpected turn upwards, but the good news was that interest rates increased to 0.75%. We have seen savings rates go up slightly, but these are still significantly below inflation. It seems unlikely that rates will rise again this year, but if they do this could mean base rates of 1% if this happens. The outcome of Brexit will determine what happens next year, a positive outcome will likely see some rate increases in 2019 perhaps up to 1.5%, which will give something to cash investors. However, if there is no positive outcome then it could be that nothing changes. In summary, the story remains unchanged. Interest on cash will remain low for a considerable amount of time. With high inflation this will erode the value of cash savings in real terms. We remain positive about the global economy; although we know there are challenges. We are less worried about China and Italian debt and more worried about trade wars which can drag down global growth and this hurts everyone. But long-term, the positives from developing economies cannot be ignored and something that is exciting to watch. If Trump is playing a game of bluff and he gets the results he needs to win the mid-terms, then expect a new barrage of Tweets for 2019 which will no doubt unsettle the world! In terms of Brexit we tend to flip-flop between thinking there will be a deal to thinking it will never happen. Labour’s stance could backfire for them, by voting down any deal and forcing an election, and then a vote on any deal would likely mean we end up in a hard Brexit scenario. We are starting to think that even though this might hit some sectors and increase inflation overall, it might not be as bad as we fear. But ultimately if Labour get elected then trying to get any deals for the UK will likely consume them for the five years they are in power, which means all the other promises go out the window! On the other side, if Labour and rebel Tories vote down the deal, no election is called but May is ousted, then we have Boris or Jacob and a hard Brexit will almost certainly happen. Away from UK politics, if the Eurozone does not move on its stance on the Irish border then a hard Brexit will happen anyway without Labour and Tory rebel interference. But as we said at the start, although the UK might see this as a threat to global instability the reality is that Brexit really is at the bottom of the pile. No-one else cares! What will cause another market crash like in 2000/2001 or 2008/2009 will be something we haven’t talked about and that is what we need to be aware of. Normally when corrections/crashes happen, within a year or two markets and values have recovered so fearing it is healthy, but we shouldn’t be consumed by that fear. Source: Charts have been sourced from Morningstar. Other data sourced from BBC, Schroders, BlackRock, IMF, Gapminder and Visual Capitalist. Any reference to a fund or share is not a recommendation to buy or sell that asset. Past performance is no guide to future performance and investments can fall as well as rise.